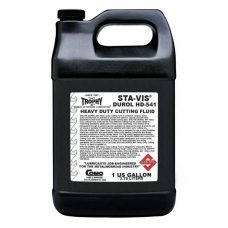 STA-VIS DUROL 541 Heavy Duty Cutting Fluid is a light-colored, active sulfur chlorine-lard oil, compounded to provide the optimum lubricity and anti-weld properties for the most demanding metal working jobs. The special sulfur-chlorine additives react with metals at tool point temperatures and pressures to form sulfide and chloride films. These low-shear films reduce the resistance to cutting, resulting in lower torque and power requirements, lower temperatures, elimination of chip welding, good surface finish and long tool life. STA-VIS DUROL ML410/Honing Oil is a high quality cutting fluid containing chlorine and fatty additives for use in machining non-ferrous alloys or honing operations. Light in color which allows excellent work piece visibility. 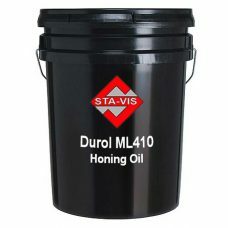 The low viscosity base oil ensures rapid heat dissipation and quick drainage from finished pieces and chips resulting in lower oil consumption. Because of its very special balance of additives, it will provide extreme pressure performance but will not corrode machine parts of fine finished work and will not stain metals such as aluminum, copper or brass. STA-VIS EP Industrial Gear Lube 100 uses sulfur-phosphorous type additive technology, blended with high quality oil base stocks to provide outstanding oxidation stability, high viscosity index, and a high flash. The special sulfur-phosphorous additives react with the metallic surfaces to form films which have high load carrying properties and anti-wear characteristics. Additional additives provide excellent rust preventive and anti-foam characteristics, and superior water separation, and excellent stability in storage and use. These additives are non-corrosive to steel, brass and bronze. STA-VIS EP Industrial Gear Lube 150 uses sulfur-phosphorous type additive technology, blended with high quality oil base stocks to provide outstanding oxidation stability, high viscosity index, and a high flash. The special sulfur-phosphorous additives react with the metallic surfaces to form films which have high load carrying properties and anti-wear characteristics. Additional additives provide excellent rust preventive and anti-foam characteristics, and superior water separation, and excellent stability in storage and use. 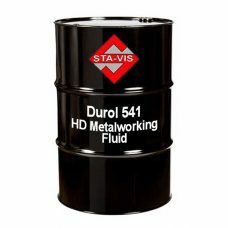 These additives are non-corrosive to steel, brass and bronze.